This whole wheat pizza dough is soft and chewy, yet remarkably easy to prepare. 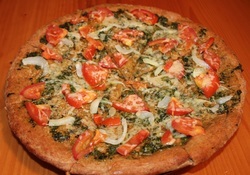 Try my pesto sauce or use your favorite pizza sauce if desired. This is great with any topping. Pour the water into a measuring cup and microwave about 30 seconds. In a large bowl combine flour, wheat germ and salt. Mix well. Make a well in the middle of the flour mixture, add yeast and honey stirring until very well mixed. Clean mixing bowl, coat with cooking spray, place dough into bottom of bowl and lightly coat top dough with cooking spray. When the leaves are well crushed add the oil and garlic. Continue crushing until smooth and well blended. Add Parmesan cheese, using pestle crush and mix the cheese into the basil. Set aside. When dough has doubled, punch down. Let rest 5 minutes. Adjust racks to lower half of oven. Set oven to 350 degrees. Coat a pizza pan with cooking spray. Place dough on countertop or cutting board and roll out into a circle. Place pizza crust on prepared pizza pan. Cook in a 350 degree oven for 15 minutes. Remove from oven and let cool. Adjust heat to 500 degrees. 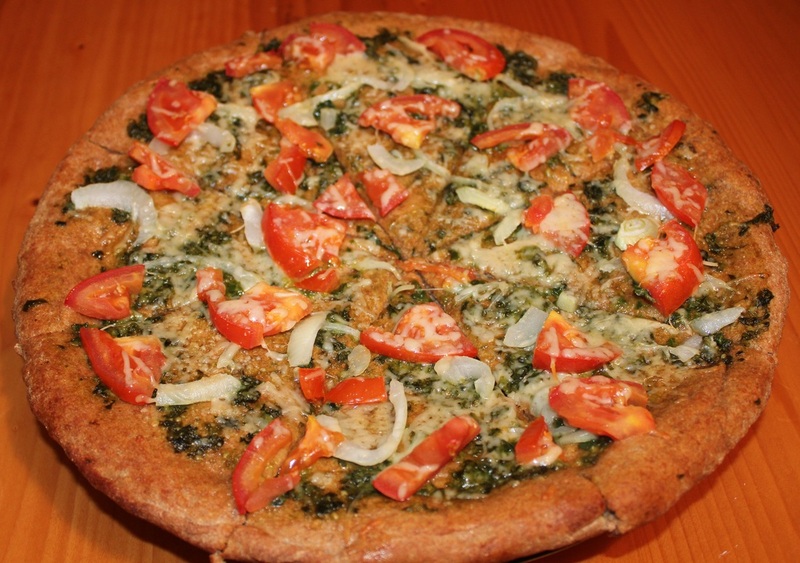 Spread basil pesto evenly over pizza, top with vegetables and cheese. Cook for 10-15 minutes at 500 degree. 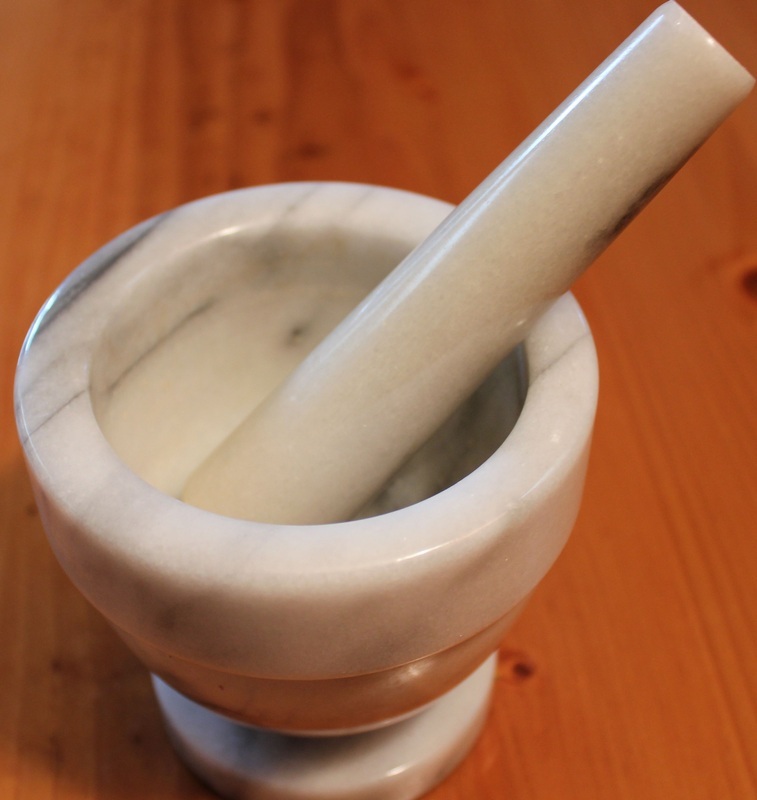 Wikipedia: A mortar and pestle is a tool used to crush, grind, and mix solid substances. The pestle is a heavy bat-shaped object, the end of which is used for crushing and grinding. The mortar is a bowl, typically made of hard wood, ceramic or stone. The substance to be ground is placed in the mortar and ground, crushed or mixed with the pestle.